Complex special NPK fertilizer with Magnesium and Boron. Its chemical composition is adapted to the special requirements of borophilous cultures with increased Nitrogen needs. It prevents Boron and Magnesium deficiencies that are often observed in the soil and climate conditions of our country and damage the production. The high Nitrogen and Boron content satisfies the requirements of vegetative growth and flowering, whilst Potassium and Magnesium directly affect the yields by increasing the carbohydrate and oil production. 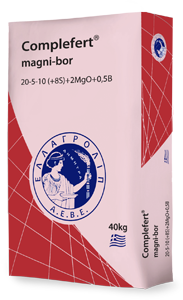 Upon Complefert® magni-bor application, complete fertilization with all the essential nutrients is achieved and additional foliar sprayings of the culture with Boron and Magnesium are avoided. Ideal for fertilization of olive trees, fruit trees, beets, sunflower and all borophilous culture types.